Voting Members: Free. Members: $150. Non-Members: $1,500. Log in to see pricing. 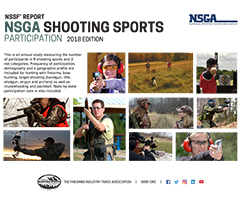 Prepared for NSSF by the National Sporting Goods Association, the report provides the industry with a current look at participation in nine different shooting sports plus two net categories of hunting and target shooting. BONUS report included with this purchase: Industry Intelligence Report - Hunting & Target Shooting Participation 2018 Edition, which includes 2003-2017 trend data. This is an annual study measuring the number of participants in shooting sports. Frequency of participation, demography and a geographic profile are included for hunting with firearms, bow-hunting, target shooting with handgun, rifle, shotgun, and airgun, in addition to archery, muzzleloading and paintball. State by state participation data included. © 2019 National Shooting Sports Foundation, Inc.